Monetary Value – How much do they spend (each time on average)? The reasoning behind RFM is simple, customers who bought once are more likely to buy again. It begins with sorting customers with based on recency and then splitting them into quintiles (5 groups). The top 20% is coded the number 5, the next 20% 4 and so on. 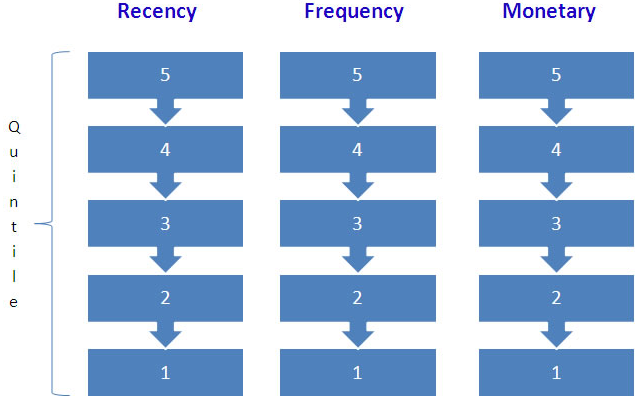 The same technique is applied on F and M variables and hence customers are assigned a ranking of 1,2,3,4, or 5 (with 5 being highest) for each RFM parameter. Then the three parameters are combined – these are called RFM cells. These RFM cell values can then be sorted to determine “best customers” i.e., those customers who have a high RFM value with 555 being the highest. Though interpretation of the RFM results is easy, careful consideration on how to handle each segment is necessary. For example, one need not send campaigns with discounts to customers with high RFM values. At the same time one should not neglect those customers with lower RFM values. For example an RFM score of 155 indicates that a customer has not purchased recently but has made a high number of purchases with high monetary values in the past. This customer may have defected to a competitor’s product due to poor product satisfaction or for customer service reasons. A marketer can contact this customer to understand the root cause and also plan a customer reactivation program by offering promotions. An RFM score of 551 on the other hand indicates a customer who has made frequent and recent purchases. This customer is active but may need to be upsold. A 515 customer is one who has made a recent high value purchase. But this customer is not a frequent visitor. May be the marketer can plan for campaigns or newsletter offering more information and incentives to see if the customer makes purchases more frequently. There are two ways to do RFM analysis. Nested and independent. The nested method divides customers into groups in the Recency dimension first, then for each group of Recency, divide the customers into Frequency dimension and then again for Monetary within the group of Recency and Frequency. The advantage of this method is the number of customers in each RFM cell is roughly the same for all cells; the disadvantage is that the meaning of the Frequency and Monetary with the same score point might be different, e.g. one customer with a “543” RFM score and the other customers with a “443” RFM score, their Frequency might be quite different though they have the same score of “4”. The independent method rates customers into groups in the R, F, M dimensions independently; the advantage is that the meaning of the Frequency and Monetary with the same score point is the same, the disadvantage is that the quantities of customers in the RFM cells might be quite different.